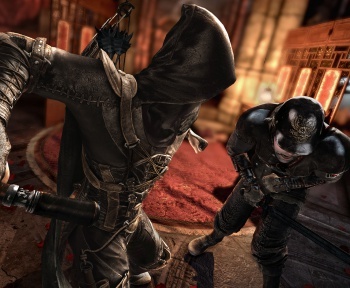 There's more to come before Thief launches in February. Thief's a franchise much beloved of old school stealth gamers, and Eidos' reboot has some fans of the series concerned. Does it have too much action? Will the absence of fan favorite voice actor Stephen Russell be a step too far? Eidos thinks not, but it also thinks that part of the problem with these complaints is that it hasn't yet shown you all of the great new stuff that Thief has to offer. Some of that will be dealt with in upcoming reveals, but ultimately this game will have to prove itself at launch. "I think hopefully, our greatest sense of satisfaction will be when the game's released and that's where we'll overcome fan resistance," says Eidos' Joe Khoury. He's been keeping track of fan comments and he understands where most of them are coming from, but they're based on a lack of information that can only be dealt with when the game launches. "We haven't shown everything we have in our pockets yet," says Khoury. Come February, we all get to see for ourselves what Thief has to offer. "There's a lot of people that remember things differently for the first Thief, and what they like about the first Thief games," says Khoury. "And hopefully 15 years from now people will be talking about what they remember about this Thief, in comparison to the first Thief!" This title launches February 25th - or 28th, in Europe and Japan - for PC, current and next generation consoles.